Its the Exam time. 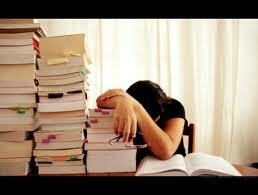 Still we are confused and nervous how to complete the entire portion and how to study for the exam. No worries we need concentration and bit if hard work. Here is some suggestions hope this will help you out. 1. The urgency of NOW! I’ve noticed a strange phenomenon pertaining to studying. For some reason, when it comes to exams, people tend to worry a lot more about their exams than they they do actually preparing. If you are currently worried about an upcoming exam, why not harness that negative energy into something positive instead? Whenever you start getting worried again it becomes time to hit the books. Do not succumb to procrastination. Do your studying and do it now! Always keep your exam date near to heart. Time tends to go by pretty fast, you may be surprised that 3 weeks left have all of sudden turned into 5 days left. Don’t let this happen to you. Organize your studies and memorize all of your test dates. Put them up on the wall if necessary. A good way of constructing your road map is to first set the date for your upcoming exam, then outline all the major topics that you would need to have covered until then. Finally, you can divide these topics into smaller tasks, describing the everyday tedious “on the ground” “getting your hands dirty” work that simply has to be done. This could be something like reading chapter 3 or solving problem 5a. This is something that I personally like to do. Whenever you begin a new course, start out by getting a piece of paper or a text document and then start recording all of the things that you need to understand before the test date. These are the things that we intend to ask our professors but instead we put it up and thus forget about it until it’s already to late. By collecting all of the I Don’t Know’s in a IDKP, you can then, at the end of each week seek out the answers to these questions either by asking a colleague or your professor or by simply going to your local library and/or the internet. 4. Are you on track? It’s easy to neglect work, even easier when it comes to education. That’s why you should appoint one day at the end of the week for the sole purpose of tracking your progress. Are you on track? Have you finished the tasks that you’ve outlined in your road map? Have you answered all the questions that you have been thinking about? If not, then no play for you until you’re back on chart. Sure, missing out on one day isn’t that bad. The problem my friend, is when one day becomes two days and two turn into three and so on. Days tend to accumulate pretty quickly. If you’re behind schedule you should strive to get back on schedule as soon as possible. The longer you wait, the more difficult it will become to get back on track.